Crystals aren’t just pretty to look at. For Pagans, some of our most potent magick can be done with the help of crystals and gemstones! For me personally, I tend to carry different crystals with me regularly – both for protection, and to draw different energies to myself. The thing about crystals is that diving into them can be a little overwhelming if you’re a beginner. I remember the first time I went to purchase a crystal to keep with my tarot cards, the sheer volume of what I had to choose from nearly made me run away! But fear not – in this guide, we’ll take a very high level look of not only HOW to use crystals in your magick, but what crystals are best for your uses. Crystals are used in magick because of their power to conduct magickal energy. When you are working with a crystal, your energy, intent, and power are focused into the crystal and blend with the magickal properties the crystal already possesses. This combined energy makes your spells and workings all that more powerful. The first thing to do when working with crystals is to cleanse them of any residual energy that it may hold. There are different ways to do this – you can place the crystal under running water, let it sit in the full moon, bury the crystal in the earth, or even use sage to cleanse the energy. You’ll read a lot of different methods to crystal cleansing, and the truth is, like most magick, it’s personal to the caster. Just be sure that the method you choose won’t damage your crystal! When you make the decision to work with crystals during your spell work, there are a few different ways to utilize these stones. Sleep with a crystal under your pillow, or on your night table. You can even hold the crystal if you’re comfortable with that. 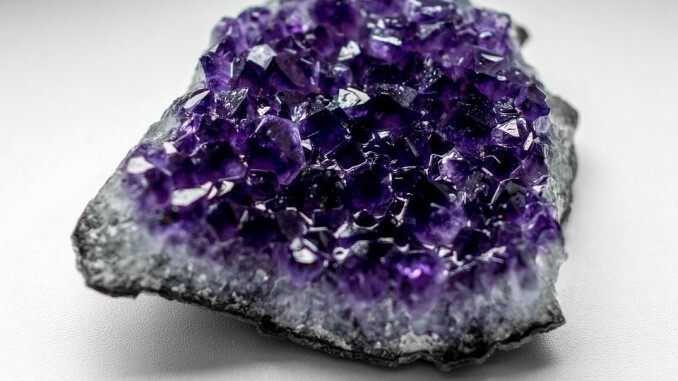 Having a crystal near your bed while you sleep (amethyst, selenite, jasper, etc.) can help promote rest and relaxation. Some stones may even help you remember and interpret your dreams! Carry crystals with you. I do this all the time. I have a crystal garden on my desk that consists of a large citrine cluster, clear quartz, rose quartz, jade, and other crystals to help promote communication, honesty, and concentration. I also carry citrine with me in my purse – that way I’m never too far from its protective qualities! Write out a spell, or a list of intentions, and keep the crystal on top of it. This is great way to incorporate crystals into physical spell work. Write out an intention list, and choose a crystal that will help with those intentions. You then set that crystal on top of your list, and the crystal will super charge those intentions. Keep this on a shelf, or an altar (if you have one) so it isn’t disturbed, and revisit your list as needed. 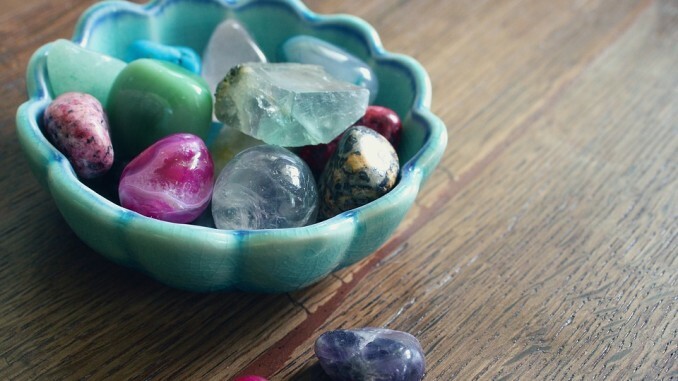 Use crystals as an energy cleanser. As we’ll talk about below, several crystal types are great to clear out negative energy. Use these during a bath or a shower, and clean out any negative feelings that you’re holding onto! Use crystals to direct energy. When you’re using a crystal point, you can literally use that point to direct the crystal’s energy wherever you’d like. As you hold the crystal, you may even feel a tremble or vibration – that’s good! That means you’re in tune with the crystal and it’s properties! As I talked about earlier, there are many different crystals to choose from, and it is VERY easy to get distracted and overwhelmed. We’ll review a few of the most commonly used crystals below. This list is not complete by any means, but will help get you started on your crystal journey! Agate: This crystal will help the spell caster by restoring energy and healing. It can enhance creativity, and intellect, and is a grounding stone. It is highly protective, and is commonly used in spells of protection for children. Amber: Amber is known for providing a calming energy to spells, but can also energize the caster at the same time; it all depends on intent. Amber draws out negativity and can be used to release physical pain. It’s also known for being a good luck charm, and bringing positive energy to the wearer! Amethyst: This purple stone is a favorite of mine. Amethyst was worn by the ancient Greeks to help with the effects of drinking too much, and since then, has been known to calm and sooth ailments. It also assists in controlling harmful behaviors, and is a great crystal to use in scrying work – as it helps with psychic awareness. Citrine: Citrine is a stone that I never leave home without. I have a giant piece on my desk in my office, and carry around a small point in my purse. Citrine cleanses negative energy, and provides focus and mental stimulation. It is a GREAT stone to use in workings with employment – because it promotes honesty and communication as well! Emerald: The May birthstone comes in a variety of different shades of green… but all emeralds are great for enhancing creativity and imagination. They are also stones to use during magick workings with love, fertility, domestic matters, and prosperity. Hematite: This crystal is a great one to keep as a staple in all crystal workings. Hematite provides protection, grounding, balancing body, mind, and spirit. Jade: Use jade when you need help with dream interpretations. It will also bring confidence, and self-sufficiency. Jasper: Jasper is a great stone for travelers. Jasper does come in three different colors – Red Jasper can be used for protection, yellow to clear the mind, and brown for concentration and grounding. Moonstone: Moonstone is another favorite of mine! It’s known to bring out the feminine aspects of the owner, bring calmness, awareness, and brings about confidence! Obsidian: Another stone that is great for grounding. Obsidian is jet black, and provides healing properties, protection, and clarity. Onyx: Another black stone, use onyx to dispel negativity, help with making good decisions, and encourage happiness and fortune. Quartz: Quartz can come in many different forms, but it is an AMAZING stone to have on hand. Clear quartz is used to clear the mind, and amplify the properties of any surrounding crystals. It is also used for logic, healing, and helps create a safe space for medication. Rose Quartz is great for children, and is known as the “mother stone”. It offers protection, opens the imagination, and promotes love and happiness. Blue Quartz is amazing to aid in concentration – great for students! Working with crystals can be fun, and also a very personal thing. The best piece of advice is to take it slow, do your research, and see which stones and crystals feel right to you! Kelly has been a practicing witch for over 10 years, and loves educating newbies to the craft! She tends to be drawn to tarot cards, scrying, and candle magick. This interest in Paganism and magick started at a young age – Kelly’s mom always says that she’s channeled Wednesday Addams, even as little girl! Kelly is a proud Ravenclaw, fangirl, believe of superheroes and fairytales, and obsesses easily. Follow her on Instagram and Twitter for more.